Sophomore guard Davon Reed walked onto the court for the first time this season and received a standing ovation late in the second half, his Canes down 14 to the Green Bay Phoenix. At the half, Reed had told one of the coaches that he’d get taped up and ready to go. His enthusiasm had inspired Miami to climb the Mt. Everest of a deficit they had formed off missed jump shots and wide-open three-pointers, but it wasn’t enough. The Phoenix handed the Hurricanes the season’s first loss, 68-55. Freshman guard Deandre Burnett racked 21 points on the board, a new career high after 19 in Tuesday’s win over Illinois. Redshirt junior Sheldon McClellan followed with 16 and guard Angel Rodriguez has 12, all in the second half. Even with the stats, Burnett was more concerned about the big picture. The Canes lost on the same day that another mid-major, New Jersey Tech, beat Michigan 72-70 in Ann Arbor, and the day after Yale upset Connecticut. Larrañaga has been around college basketball since 1967, playing in Providence, and said that the mid-majors are closing the gap fast because of player development. Sykes scored 18 points in the win, second only to Carrington Love’s 20 for Green Bay. 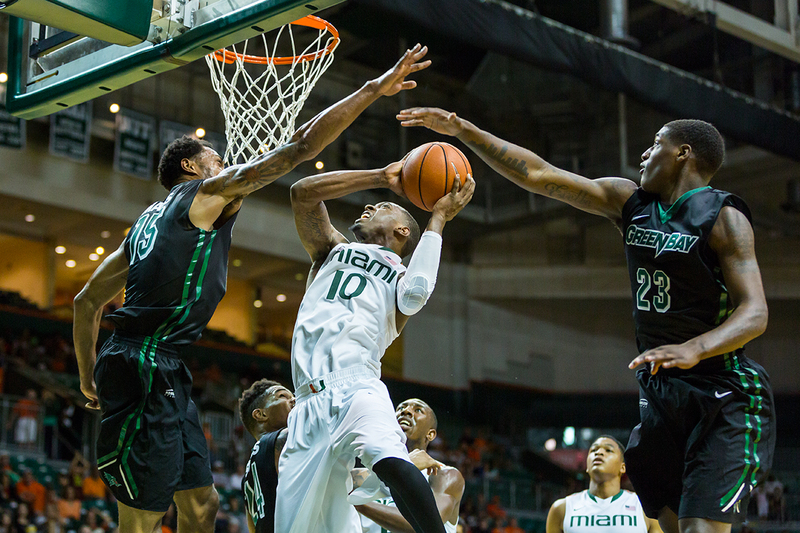 The Canes tip off at 7 p.m. Monday at the BankUnited Center (BUC) – the last game before final exams.